Islam Around Us: Syrian Kurds battle al-Qaeda-linked rebel faction. Syrian Kurds battle al-Qaeda-linked rebel faction. 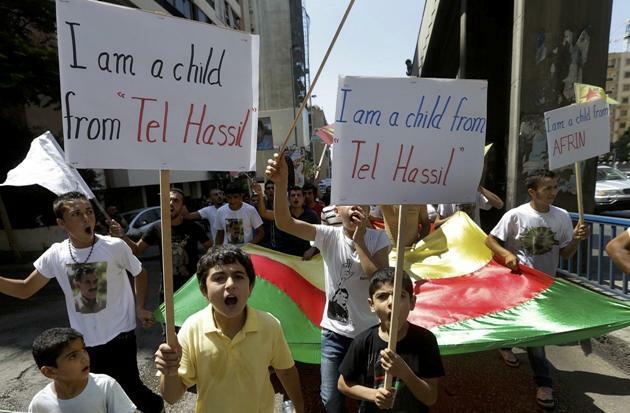 BEIRUT | AP | 20 Aug 2013 :: Kurdish militias fought al-Qaeda-linked rebel groups in north-eastern Syria on Tuesday in heavy fighting that has helped fuel a mass exodus of civilians from the region into neighboring Iraq, activists said. The clashes between Kurdish gunmen and Islamic extremist rebel groups have sharply escalated in Syria’s northern provinces in recent months. The violence, which has left hundreds dead, holds the potential to explode into a full-blown side conflict within Syria’s broader civil war. Tuesday’s fighting, which pitted Kurdish militiamen against rebels from the Islamic State of Iraq and the Levant, was focused in three villages near the town of Ras al-Ayn in the predominantly Kurdish Hassakeh province, according to the Britain-based Syrian Observatory for Human Rights monitoring group. There was no immediate word on casualties. Around 30,000 Syrians, the vast majority of them Kurds, have fled the region in recent days and crossed the border to the self-ruled Kurdish region of northern Iraq, the United Nations refugee agency has said. The new arrivals join some 1.9 million Syrians who already have found refuge abroad from the country’s relentless carnage. The massive exodus has put a severe strain on Iraqi Kurdistan’s regional government and aid agencies ability to accommodate them all. The UNHCR said it is sending 15 truckloads of supplies 3,100 tents, two pre-fabricated warehouses and thousands of jerry cans to carry water from its regional stockpile in Jordan. It said the shipment should arrive by the end of the week.